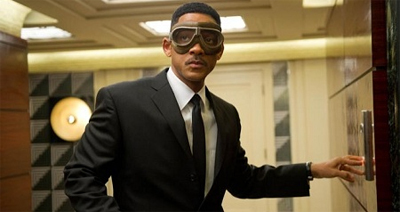 Men in Black 3 is a fine film. Like Men in Black and Men in Black 2, it’s a perfectly entertaining piece of popcorn entertainment if you’re willing to just go along with it. It’s not superb, it’s not exceptional, but it’s not bad either. It’s a decent movie. It manages to probably offer some better moments than the earlier two films, but these are averaged out by some painful deficiencies. You lose Tommy Lee Jones for most of the runtime, but you gain Josh Brolin. That’s a fairly reasonable trade, even if Brolin and Smith don’t share the same chemistry. You get the same wonderful production design, this time heightened by a sixties setting, but a plot that threatens to evaporate if you think about it too hard and any number of developments that are far too easy to predict. Nothing is truly fantastic, but nothing is exceptionally terrible. It just sort of is. 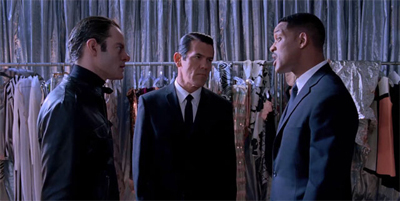 If you ask me, the best part of the Men in Black films is the partnership of Will Smith and Tommy Lee Jones. It’s a really weird combination that really shouldn’t work, but actually does. No matter what special or practical effects that the film might feature, the core appeal of the movies is the surreal and wonderful dynamic between Smith and Jones. The pair just play to each other’s strengths. Smith is overstated; Jones is understated. Smith is obnoxious; Jones is scathing. Smith is flippant; Jones is dour. Either performance on its own would be fairly unremarkable, but the two go together like peanut butter and jelly. Or, so I’m told. 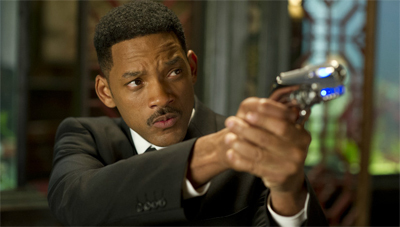 So, there is a bit of a problem with Men in Black 3. Without spoiling more than people will see in the trailer, the plot involves time travel. 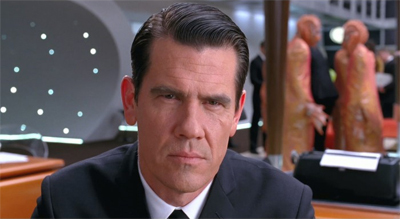 Will Smith’s Agent J is paired with a younger version of Agent K, played by Josh Brolin. Brolin is pretty much perfectly cast. He’s like a half-formed Tommy Lee Jones. He has the deadpan down perfectly right, and is remarkably understated. However, he can’t help but seem more energised than his elder counterpart. This version of Agent K isn’t the life of the party, bit he’s nowhere near as bitter and world-weary. This means that the dynamic can’t help but feel a little bit off, for lack of a better phrase. That said, the movie does try to compensate. The best part of the film is actually a remarkable creation, an alien named Griffen played by Michael Stuhlberg. Griffen has the unique ability to experience all of time at once, moving through the timeline like some sort of tourist. He’s constantly calculating his variables and discounting futures that have been ruled out by casuality, and he’s something of an existential philosopher. His favourite moment in human history is a touching example of a random confluence of improbabilities resulting in a statistically unlikely outcome. Griffen, as played by Stuhlberg, almost feels better than the film surrounding him. Boris did something in 1969 that altered the timestream, and J needs to turn it back. Don’t stop to ask (a.) why Boris’ people are only invading now, 40 years after Boris successfully thwarted an attempt to stop him, or (b.) why – if J is in timestream where Boris succeeded the first time – Boris needed to go back in time in the first place. Sadly, the movie isn’t quite as self-aware as Austin Powers: The Spy Who Shagged Me when it comes to temporal mechanics, a problem compounded by an overstated need to explain everything for the audience. For example, at one point, we’re told that African-Americans were still victims of institutionalised prejudice in 1969. It just feels like the movie is treating us like idiots. There are even some strangely ponderous and clumsy character moments shoehorned into the journey to the past – especially for J, who makes a predictable personal discovery. That said, if the biggest improbability is the suggestion that Alice Eve could ever grow into Emma Thompson, I think we’re fine. The production design is lavish, taking advantage of the retro sixties setting. The Men in Black offices are populated with aliens who look like they’ve wandered off classic Star Trek or even Doctor Who. When J and K use rocket packs to cross the breadth of the country, the devices bear an uncanny resemblance to Daleks, the infamous genocidal metallic pepper pots. Indeed, the decision to base an adventure around the moon launch, while obvious, can’t help but call to mind Steven Moffat’s ambitious Day of the Moon, which featured a similar attempt to usurp that famous moment in history. Barry Sonnenfeld makes sure that the film is saturated. The problem is that some of that brightness is inevitably lost in the 3D transfer. While the decision to film in 3D does minimise the loss, I can’t help but feel that the bright colours would look infinitely better projected in standard 2D. Still, it’s better than a lot of the 3D I’ve seen of late, but not quite good enough for me to wholeheartedly recommend seeing the movie in that format. 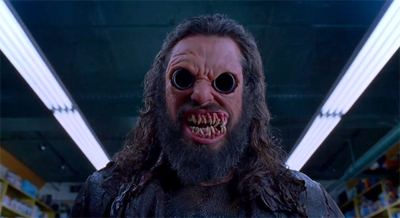 Like the movie itself, Jemaine Clement makes for an enjoyable (rather than exceptional) villain, chosing to play the villain-of-the-film in the style of a scenery-chewing Shakespearean performer. It seems like Clements larger-than-life performance is more of a gag than anything else about Boris, and it’s an amusing one – albeit not quite enough to sustain the villain of an entire film. Etan Cohen’s script seems aware of the character’s limitations, and the fact that”Boris the Animal” is just a plot device to get the time-travel plot going. As a result, the film seems to relish crafting the most two-dimensional villain possible, one who recycles a significant portion of his own dialogue. Watch out for multiple uses of “it’s just Boris!” and “agree to disagree” uttered from Boris’ book of stock phrases. It is a clever and wry way of writing and portraying a villain, but it’s not the most engaging. It’s not bad, or objectionable, but it doesn’t feel that exciting or impressive. It doesn’t feel like it adds too much to the film. This is how it’s gonna be, K? I don’t want you to think that I didn’t like the film. I liked it just fine. It’s a perfectly capable film, with a few chuckles and diverting plot. It’s not a must-see or a high recommendation. It’s more of a diversion on the summer blockbuster schedule than a main event, and that’s perfectly fine – once you know that’s what you’re getting. It’s easy-going, charming and hard to dislike. It’s just not much more than that.